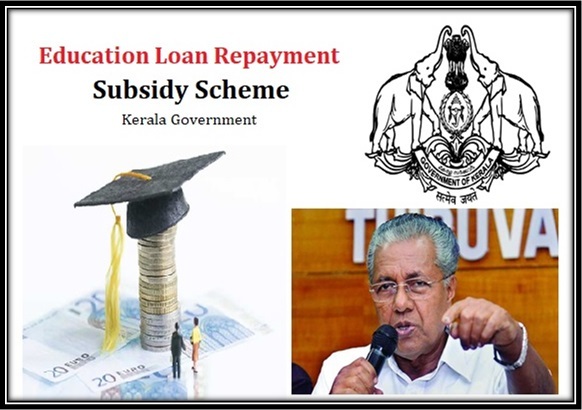 The state government in Kerala has announced the launch of new loan repayment scheme for students in the state. The new scheme is termed as education loan repayment subsidy scheme. Under the scheme it is certain that students will be able to repay back their education loan. The new education loan repayment scheme was launched by the government of Kerala state on 5th August 2017. The last date for students to get registered under the scheme is 31st October 2017 for this academic year. The scheme shall be supervised by the state government and students will be able to get registered via official website elrs.kerala.gov. The new loan repayment scheme is launched by the state government to help students repay their loan debts amount. This amount can be repaid back at the time of course completion. The state government shall ensure that students get full support for a period of four years till they don’t complete their course. Under the scheme the state government has categorized the loan repayment account under four distinct categories. This category offers with 9 lakhs sanction limits. Students are expected to repay back the loan amount within four years time limit between 1st April 2012 to 1st April 2016. It is certain that the student should have settled their loan account by 31st March 2016 under RBI norms. It is also certain that the student should have maintained his standard account in case he or she is looking forward for getting full benefit under the scheme. Under this category students have a sanction limitation of Rs 4 lakh. It is also obvious that loan amount has to be as NPA (Non performing asset) in the loan books as on 31st march 2016 according to RBI norms. Student can also make default amount repayment regularly in his loan account annually or even make a single time payment to settle the loan amount. Under this category the loan sanction limit is between 4 to 9 lakhs. Non asset category loan type according to RBI norms. Students are free to make a single time payment of loan amount or clear overdue and then close the loan account. Student is expected to disclose this feature with the bank before taking the loan amount. This loan account is offered for mentally or physically handicapped student who is suffering from over 80 percent disability. For such student it is obvious that he or she has to apply for the loan before 31st March 2016. It is certain that to get registered under the scheme student should be resident of the Kerala State. It is certain that all details provided should in fact match with the details given to the bank. The loan amount can be availed from any of the branch or bank approved by the state government. This may include Kerala state bank, cooperative bank of Kerala or other 14 banks. Any student who is registered under NRI/ Management quota or seat is not eligible to get registered under the scheme. This refers to any student who has taken admission in any private college apart from getting merit seat. Any student who has taken admission for nursing seat under management quota can get registered under this scheme. Students who want to study abroad can not apply for loan under this scheme for repayment. To get registered it is certain that students have to provide with their PAN card number. Upper income limit for student’s family is Rs 9 lakhs per annum for general category and for physically handicapped student it is Rs 4 lakh per annum. It is also certain that student who needs to get registered under this scheme should have four times more income as compared to repayment amount. In case any student who has already taken the loan and gets physical handicapped due to injury can apply for immediate assistance irrespective of the loan amount or due date for repayment. Students are expected to provide with their 10th pass certificate of a school in the state. Students are expected to provide with their copy of Aadhar Card. Students who need to get registered under the scheme are expected to provide with details of their PAN card number. A copy of the eligibility certificate issued by the village officer that has been attested by the Gazetted officer. Death certificate that has been issued by death registrar for deceased student. In case the student is physically handicapped then it is certain that a certificate of disability has to be issued by the government authorities. The student also has to provide with a copy of course completion certification. In case the student was not able to complete the course then a certificate from head is also required to be furnished. If possible then the student has to provide with a copy of their salary certificate. Once all details and copies or required documents are submitted then the form can be submitted. Any student who wants to get full benefit of the scheme can visit the online website elrs.kerala.gov. and then click the “registration form” option. A simple registration form will be provided and students are expected to fill the form and submit. It is also certain that all required documents are also to be submitted along with the form. To get the registration for students have to log on to the official web portal. You have to provide with all your details on the registration for along with all required documentations. Once the process of documentation and registration is complete, students will be provided with valid user ID and pass word on mobile phone. The students will be able to log in to the official website using the ID and PW provided. Now the students are expected to provide with details of their permanent address. The students also have to provide with details of their guardian or parents. In case the student is suffering from physical or mental disability then they have to provide with co-borrowers details. Students also have to provide with all possible details of the course for which they want to get loan repayment facility. They also have to provide with details of NRI quota or manage seat details. Students who want to get registered under the scheme also have to provide with details of course completion dates. Student’s category at the time of registration is also to be provided by the students. It is also important that students have to provide with the details of the bank from which they have applied for the loan amount. Students have to provide with the details of the loan amount they have taken from the bank. All possible details about the loan amount repayment also have to be provided along with valid interest rates. All details of the overall family income is also to be provided at the time of registration. If the student is employed then it is certain that he or she will have to provide with details of their employment. This is not required in case the student is suffering from 80 percent physical handicapped condition. Annual income of the students family members are also to be provided at the time of registration. Students are also expected to provide with details about their handicapped condition including the date from when they have been suffering from this condition. The overall loan amount they expect to be waived off for the student is also to be provided. Students also should provide with right category for government support that they want to avail for loan repayment under this scheme.